On Jan. 31, from 5 to 8 p.m. Mike’s Famous Harley-Davidson at 951 Bank Street, New London, CT, will host the official kick-off reception to celebrate the commissioning of the USS South Dakota (SSN 790) the Navy’s next generation Virginia class fast attack submarine. The invitation-only event will honor the first sailors of the original USS South Dakota. In addition, all active and veteran military, and those who built the new submarine at General Dynamics Electric Boat in Groton, Conn. are welcome at the event. See below for details of how to obtain tickets if you are active or veteran military or an EB employee. Commanding Officer Cmdr. Craig L. Litty, Chief of Boat YCOB-HMCS Adam Goulas, South Dakota’s former Governor Dennis Daugaard, the USS South Dakota Commissioning Committee and a host of high-ranking Connecticut government officials will be in attendance along with Harley-Davidson® representatives and other VIP guests. There will be entertainment, food and beverages by RD86 Restaurant of New London, and guest speakers at this official kick-off reception. Additionally, there will be a private viewing of the Commemorative USS South Dakota 2018 H-D Street Glide® motorcycle and 1956 Ford Thunderbird Medal of Honor Car hand painted by word-renowned artist, Mickey Harris, who will also be in attendance and speak about these fabled machines. Both historic pieces will be displayed together under one roof from Jan. 29-31 only at Mike’s Famous Harley-Davidson. The public is invited to visit the dealership to see these vehicles on Tuesday, Jan. 29, and Wednesday, Jan. 30, from 12 through 7 p.m. Food and beverages will be complimentary from 12 to 2 p.m. and a happy hour will occur from 5 to 7 p.m.
After the commissioning, the Commemorative Street Glide® motorcycle will be on its way to the Sturgis Motorcycle Museum & Hall of Fame in South Dakota. A motorcycle ignition key will remain on board the submarine and any USS South Dakota sailor can ride the bike when visiting the museum. The bike will stand ready as the crew’s official motorcycle and will help build bonds between the CT-based sailors and the State of South Dakota as they experience the excitement of riding a motorcycle on open road. The Virginia Class is the first class of submarines developed for post-cold war missions. These fast-attack submarines have the newest technology the Navy has to offer. The USS South Dakota (SSN 790) is armed with four torpedo tubes as well as two Virginia Payload Tubes (VPT), each capable of holding six vertical launch Tomahawk missiles that can hit on-shore targets up to 1,240 miles away. The ship is 370 feet long, 10 feet longer than a standard football field. It is 34 feet wide and is nearly as tall as a 12-story building. The USS South Dakota will be manned by 132 crew members: 15 officers and 117 enlisted servicemen. The employees of General Dynamic Electric Boat will also be acknowledged for their building of this new submarine. 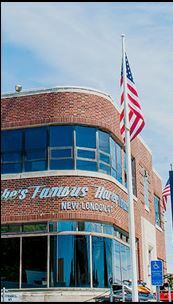 A proud supporter of the United States Military, Mike’s Famous® is the largest Harley® dealership in southern New England. In 2015 Mike’s Famous® received the Military Community Support Award as Business of the Year by the Eastern Connecticut Chamber of Commerce.